This year’s election cycle has given rising campus leaders a chance to shine the spotlight on problems that SGA can focus on in the coming year. With the departure of President Peterson and a heightened awareness of campus issues like dining and mental health, it is important that the student body is represented by leaders that will take advantage of the opportunities that this dynamic time brings. 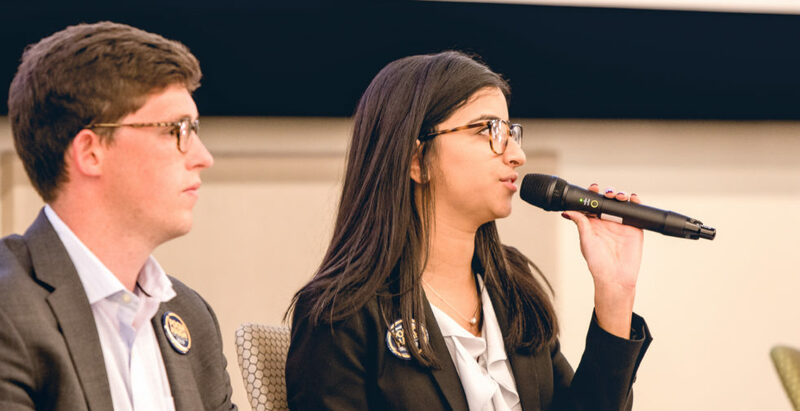 While Carson Silbert and Francis Yang would undoubtedly be effective SGA leaders, Pooja Juvekar and Haigh Angell’s actionable platform and diverse team gave them the edge when the Technique staff decided who to endorse this year. Dead-end promises and nebulous verbs like “promote” and “empower” are inevitable in any platform — except that of Jimmy Forsmo and Shishir Bandi — but Pooja and Haigh paint a clear picture of their goals for SGA to accomplish in the coming year and the campus community that they want to build. The two platforms overlap significantly in several areas, but they each posit unique ideas that the eventual winners should implement. Carson and Francis’ “Hello my name is…” initiative, while questionable in its efficacy, brings a new dynamic to campus mental health conversation. Expanding the counseling center has become the go-to solution championed by many campus groups, but complacency with that singular answer ignores the complexity of the issue. The “Hello my name is…” idea shows that improving campus culture around mental health shouldn’t end at a more robust counseling center. The candidates on both tickets have impressive histories in SGA, but two accomplishments stood out to us. First, Pooja’s work in improving the internal communication of SGA has been invaluable in ensuring its smooth operation. Second, Haigh’s successful efforts to introduce mini-mesters into Tech’s curriculum will put him in a unique position to evaluate their debut in the fall. While the nature of SGA makes it difficult to attribute accomplishments to individual members, Pooja and Haigh’s initiative in these matters reflects well on their ability to bring ideas into fruition. We would be remiss if we did not mention the ticket of Jimmy and Shishir, whose platform consists of a single point: veto everything until the counseling center has a 500:1 student-to-counselor ratio. Between their meme-based campaign and their lack of SGA experience it is clear that they weren’t entirely viable candidates, but their goal of making a statement was nonetheless achieved. It is simply impractical to sabotage every aspect of SGA until a single, complex target is met. Cabinet appointments are an important factor in our decision, and the combination of experience and diversity in Pooja and Haigh’s team leads us to believe that they would put together an effective group if they were to be elected. This, in addition to their experience, tangible platform points and representation of a larger swath of the student body — not just those in For The Kids or Freshman Leadership Organizations ­— solidified our decision to endorse their ticket this year.